It's been only three days since the iPhone 4S started selling and it has already managed to allure more than 4 million people into buying it. Put in retrospect, in its first days of availability, the iPhone 4S outsells its predecessor more than two times. Whoa, those are some serious numbers. This is an astonishing accomplishment taking into account that the device is currently available in only 7 countries - the US, Australia, Canada, France, Germany, Japan and the UK, followed by another 22 countries on October 28 and 70 more by the end of 2011. 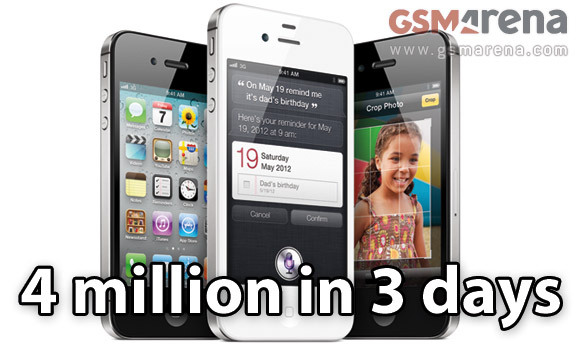 This means that roughly 925 iPhone 4S have been sold every minute for the past three days. It's that crazy. Samsung, on the other hand, don't share the crazy success of Apple's latest version of the iPhone, but they have also scored a landmark of their own. 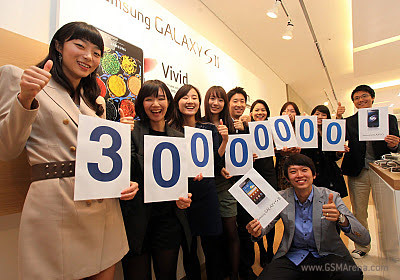 The Galaxy S family has surpassed a total of 30 million sales globally. The Galaxy S II has generated more than 10 million sales since its initial launch in April, while the original Galaxy S has sold in a total of 20 million unit sales since its release in 2010. Let's hope we are going to see those records shattered by the upcoming Nexus Prime, which has been oh-so-bashfully making its way to the public.